Almost every German knows Paul Maar’s stories about Das Sams – a strange little creature, a kind of hybrid between Alf and a wish fairy, which more or less happens upon a middle-aged, reclusive man called Bruno Taschenbier. For reasons I am unwilling to explain here (you’ll have to read up on it by yourself), Taschenbier is adopted by the Sams as his “Papa”, which, apart from causing a lot of chaos in his hitherto quiet and boring life, has its benefits, since The Sams finds itself in the possession of a lot of blue freckles on its face, and with every freckle it is able to grant a wish to Bruno Taschenbier. Each of those, however, must be formulated precisely, otherwise… well, see the above concerning chaos. First published in 1973, it took decades before the author finally agreed to a film adaptation of his book series. For the wonderful edited volume on Paul Maar – Studien zum kinder- und jugendliterarischen Werk (edited by Andreas Wicke and Nikola Roßbach) I have written a little essay on the film adaptations, which are interesting from a narratological perspective since the first film combines the content and story structure of the first three books within 90 minute’s screen time. I have written an article on multiperspectival narration in Raquel Palacio’s novel Wonder for the international poen access journal interjuli. The German-language article explores the idea that recent disability narratives gravitate towards more complex forms of storytelling, in this case: towards employing multiple narrators or narrational perspectives. The issue of interjuli contains a number of other wonderful entries. One of the most popular picture books series is Sven Nordqvist’s Pettersson & Findus – no wonder that the German film director Ali Samadi Ahadi has recently directed a children’s film based on some of Nordqvist’s stories. For the 50th supplement of the (German-language) Lexikon des Kinder- und Jugendfilms I have written a small article that investigates the film’s production history and analyzes selected aspects of the film: Even though it mainly targets elementary-school-level children, Pettersson & Findus – Kleiner Quälgeist, große Freundschaft employs a surprisingly complex cinematic aesthetics, using the arsenal of contemporary blockbuster cinema. I’ve been researching the way in which digital games have influenced contemporary filmmaking for a while. One of the outcomes of that research is an article that has just been published in the latest – and sadly last – issue of the (German-language) Lexikon des Kinder- und Jugendfilms, a cornerstone of the German children’s film research landscape. The article, „Computer-Spiel-Ästhetik im Kinder- und Jugendfilm“ outlines basic varieties of computer game aesthetics in cinema: Film adaptations of computer games, computers as set pieces in film, game worlds in film, computer game characters in film, computer game paratexts in film, interactive films as new forms of cinematic narration. Within that framework, I discuss a number of films such as Wreck-it-Ralph, Spy Kids 3D, Scott Pilgrim vs. the World, Star Wars: Episode 1, Tron, eXistenZ, Run Lola Run, and others. 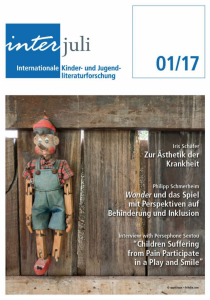 You can find the article in the 50th supplement of the Lexikon des Kinder- und Jugendfilms, edited by Horst Schäfer. Für die von uns herausgegebene wissenschaftliche Buchreihe „Kinder- und Jugendliteratur Intermedial“ haben Tobias Kurwinkel, Annika Kurwinkel und ich nun eine eigene Überblicksseite erstellt. Auf www.kinderundjugendliteraturintermedial.de finden Sie die wichtigsten Informationen zu den Bänden. Die Publikationen beschäftigen sich mit der Umsetzung von Klassikern der Kinder- und Jugendliteratur im Film. Bisher sind Bände zu Astrid Lindgren, Harry Potter und zum Motiv der Zeitreise erschienen. Bände zu Michael Ende und Otfried Preußler sind in Vorbereitung. 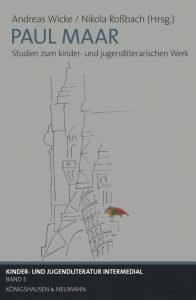 Tobias Kurwinkel, Annika Kurwinkel and I have built a website for our (German-language) academic book series „Kinder- und Jugendliteratur Intermedial“. On www.kinderundjugendliteraturintermedial.de we give an overview of the volumes published so far. All of them deal with the adaptation of classical children’s book in film. So far, we have edited or supervised volumes on Astrid Lindgren, Harry Potter, and the motif of time travel. Fortchoming volumes are devoted to the work of Michael Ende and Otfried Preußler. Auch die 65. Ausgabe der Berlinale wirft wieder einen Blick auf aktuelle Kinderfilme und Jugendfilme. Auf KinderundJugendmedien.de bieten wir einen kurzen Überblick über die Filme, die vom 5. bis 15. Februar 2015 in der Sektion „Generation“ präsentiert werden. Hier geht’s zum Artikel! For the next two years, I will be an Associate Junior Fellow at the Hanse-Wissenschaftskolleg Delmenhorst (Institute for Advanced Study) as part of a conference and publication project: Tobias Kurwinkel, Benjamin Moldenhauer and I will prepare a three-day conference on „fear and self-empowerment in children’s cinema“ (Angst und Selbstermächtigung im Kinderfilm). The results of the conference will be published in the form of a state-of-the-art handbook on the topic. The conference will bring together film scholars, child psychologists and filmmakers who will reflect on the changing role of fear and self-empowerment as an elementary part of children’s film reception, and as a frequently overlooked aesthetic element in children’s cinema. The Hanse-Wissenschaftskolleg (HWK) is a foundation of the federal states of Bremen and Lower Saxony and the city of Delmenhorst which promotes the disciplinary and interdisciplinary collaboration of internationally renowned scientists and young investigators. More information here.